Laundry rooms are notorious for being the most cluttered spot in the house. It's easy for this room to be a catch all space where messes pile up. Whether you have a spacious laundry room or a small area to work with, the storage solutions below will help you get your space in shape. 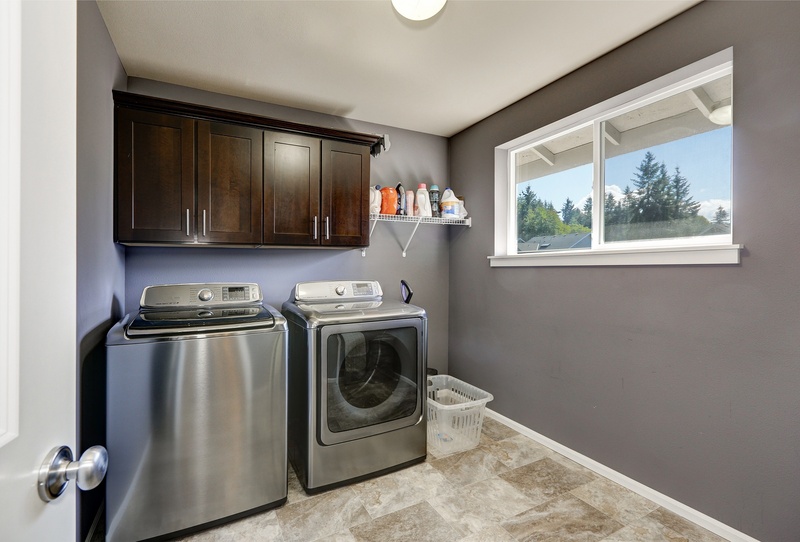 For many homeowners, finding space for a laundry room often means using an otherwise unusable room. An odd nook or corner can become your best bet for a set of shelves to provide valuable storage space. Look for shelving options that allow for adjustments in height and width, letting you customize them for your space. Feeling especially handy? Go online to find countless tutorials for building inexpensive and completely customized shelves on your own. Once your shelves are up, get creative with storage options. Simply clearing off the clothespins, dryer sheets, and unmatched socks from a surface can make the whole room look cleaner. Choose baskets and bins that match your decor style. Coordinating containers are a great option for keeping bits and pieces hidden away while giving a small space a clean and put together look. Laundry supplies aren't the most attractive items to have on display, but a few good containers can make a big difference. Find a set of large glass containers with lids to hold laundry pods, powdered detergent, and clothespins. Liquids can be put in large glass drink dispensers, eliminating the need to lug a heavy container on laundry day. When you purchase supplies in bulk, fill the containers then store the rest of the product in its original packaging, out of sight. Tight on space? There are storage solutions to make your laundry room work more efficiently. Slide out features are an excellent way to keep items stashed away. Install drawers for storing supplies, put baskets on slide out rails to keep laundry hidden, and put an ironing board on a rail to easily slip it back into its place after use. Laundry might not be your favorite weekend chore, but it's one that needs to be done. Creating a laundry room you don't mind spending some time in can help the task feel like less of a burden. After adding storage solutions, give your laundry room a quick face lift to make it a more calming and pleasant space. A fresh coat of paint can instantly change the vibe in the room. Choose a light, soothing color to make the room feel clean and open. Pay attention to lighting as well. Overhead lights can help, but there's nothing better than natural sunlight. Opt for shades that allow natural light to stream in. Window treatments are a design detail that can make any room more usable and beautiful. With hundreds of fabric choices and manual and motorized options there are many ways to customize your window treatments to match every room in your home. Call Polar Shades at 702-260-6110 for a free in-home consultation today and watch your laundry room transform into an organized sun controlled haven.